Wow, has it really been almost a month since I last posted??? This summer (well, the entire year, in fact) has been hectic and the last few weeks have been particularly busy. Hopefully now that my kids are in school I'll have more time to share some fun things here. And what could be more fun than the Quilt MATCH Manhattan? That's me in the middle, right between Mark Lipinksi and Luke Haynes, and we'll be duking it out, all in the name of fun, for a design competition at the After Dark Cocktail Party at the home of Victoria Findlay-Wolfe. 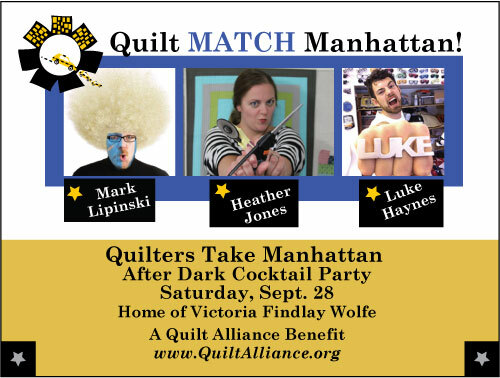 This evening event is part of the Quilters Take Manhattan, which is a fundraiser for the Quilt Alliance, a wonderful organization whose mission to is document, preserve, and share the story of quilts and their makers. I'm a huge fan of the Quilt Alliance and their work, and I couldn't be more honored to be a part of this great weekend. The main event of the Quilters Take Manhattan takes place on Saturday, September 28, but there are lots of other fun activities that weekend as well. You can find out more about the event on the Quilt Alliance's site and purchase tickets for the event here. See you in NYC!! !